Experience is knowledge and the reason Karin Adams is the “go to” person for any real estate needs. 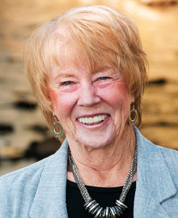 Karin has the honor of being one of the longest continually active licensed real estate brokers in Chaffee County. She specializes in ranches, resort, recreational, and commercial properties throughout Colorado staying informed on the markets with the broad network of contacts she has established over her incredible real estate career. She knows that making a wise investment requires time, research, and commitment. It is crucial to have a broker who has a solid understanding of how to facilitate transactions for the benefit of a client’s specific needs. Karin has extensive knowledge of various areas with differing property rights, zoning requirements, water rights, access issues, and tax implications including many transactions accomplished with 1031 tax free exchanges and retirement accounts established into real estate holdings. She is a tenacious and creative broker who uses her knowledge, contacts, and resources to finalize challenging transactions. Karin’s commitment to the communities is reflected in her participation on innumerable boards of nonprofit and civic organizations. She has contributed generously with time and funds to the numerous organizations. Karin is also a long-standing member of the Realtors Land Institute, which is the nation’s premier land brokerage association that specializes in professional land brokerage practices throughout the United States and abroad. Currently serves on the Executive Committee for the Chaffee County Economic Development Corporation.